If John Pagano gets a head coaching job in the offseason, should the Chargers go after Dennis Allen or Rex Ryan as a replacement? I know everyone wants to make the Darren Sproles comparison, but there are times (like that run) Branden Oliver is more like Mike Tolbert. Terrific play by Branden Oliver to stay on his feet. That was great. That first down was all effort by Branden Oliver on those two plays. Nice blitz pickup by Branden Oliver on that completion to Green. Oliver did a nice job picking up a blitzer on that pass to Green. Good sign for a rookie RB. Nice blitz pickup by Branden Oliver, allowed Philip Rivers to find Ladarius Green on crossing route. Oliver playing well this series. No argument here. RT @BrianNorgard : The most underrated NFL player of this decade is Philip Rivers. DJ Fluker just got beat badly. I wish I was in every one of your living rooms right now as you talk about Branden Oliver and how Donald Brown should not play again. Philip Rivers is so good under pressure. He's incredible. 50-yard catch and run to the @nyjets 23! You can't teach that. Branden Oliver left two Jets grasping for air on that 50-yard catch-and-run. Chargers in scoring position again. Nothing in this 2014 season has been more impressive than watching Rivers work the pocket like late-80s Dan Marino. Maybe Branden Oliver isn't a carbon copy of any former Chargers running back, guys. Ever think of that? Before you start burying Donald Brown, remember that he was playing well today before getting hurt. 14 first downs for the #Chargers to the #Jets 3. RT @UTgehlken : Chargers RT D.J. Fluker headed to locker room ...> Falling rapidly here. Good thing Chargers will take 3-score lead to half. Malcom Floyd headed in as well> RT @UTgehlken : Willie Smith in for Chargers RT D.J. Fluker, who just entered locker room for evaluation. Chargers WR Malcom Floyd headed to the locker room with an unknown injury. BRANDEN FREAKING OLIVER with an outstanding drive. He ran well. He blocked well. He caught the ball. He did everything. Deserved that TD. How to run on #Jets no.1 ranked run defense: Insert 5'8 rookie RB Branden Oliver. And the Chargers will get the ball again to start the 3rd quarter. Chargers beating up Jets with 4th string RB and 3rd string offensive line. Branden Oliver exhibited a nose for the goal line that has been scarce among Chargers RBs the past few years. Legursky was terrific sealing the left, while moving downfield, on Oliver's draw TD run. 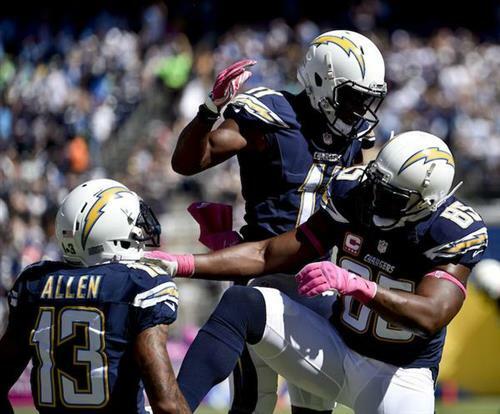 Bolts had gone 14 straight quarters without a rushing TD. The #SDSU Aztecs marching band is getting ready to take the field for halftime. Promise me no Katy Perry. I beg you. I will leave. Brandon Flowers with his second interception. Philip Rivers just ran into the locker room, then came back to take final play. That was a bad throw, but nice pick by Flowers. Can Kellen Clemens throw a Hail Mary? Rivers in the locker room. No, he came back out!